Pics and Kicks: Bartly Heber. 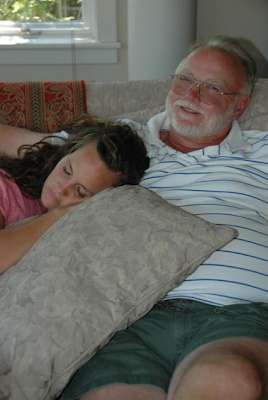 You were the BEST uncle a girl could have ever asked for. Thank you for loving me like a daughter. but I take comfort in knowing that we will all be together again someday. Give Gavin a big high five from me! I LOVE you Nat! This has been quite the 18 months hasn't it! I'm so grateful for the gospel and to know the God's plan or salvation. One of my favorite memories of Bart was spending time on his huge boat that he was sailing around the world with. Remember bringing baby Raleigh out on the dingy to get on Bart's massive sail boat in the middle of Waimea Bay? Remember watching the dolphins jumping and spinning out there? Seriously, how cool was it that Erik and Gavin got to go from Big Island to Oahu and then Gavin sailed from Oahu to CA with just Bart alone...eating fresh Ahi that they caught as they sailed??? WOW! What a party in heaven they must be having now! I'm here for you babe. Love you! Bart is one of those people that you are just drawn to. He made me feel so comfortable being around him and it always hit me how MUCH he loved your mom and you and Gavin. He seemed protective, loving, and oh-so FUN! So, so full of LIFE. I have fun memories of sitting at our favorite little beach cafe almost a year ago and we looked up...who should come walking in but Bart and Gretchen! We spent the whole time talking about you, Gavin, your mom, dad, and each of your sweet little boys. He just laughed and laughed at the memories. He said that they were SO HAPPY living in Arizona, and so very content. I'm very happy that he was happy! His fun spirit was so contagious. I LOVE you, Natalie! Please give your mom and dad a huge hug from me. I'm so sorry to hear of your loss, I'm thinking of you! Your words have helped so much as I grieve my parents. If I can help at all, please don't hesitate to contact me. Sorry for your loss Nat-Nat. I will never forget your sweet hubby referring to you as Nat Nat in front of 100s of BYU-H students. Aaron and I have had a rough past year as well. From him being stuck in a Blizzard to bed-rest, to Galbladder surgery. Remember Heavenly Father gives you only what he knows you can get through. Take Care, and where would we be without the gospel? I can't imagine. I love you!